As someone who has worked in fashion, albeit “just as” an eCommerce Manager, I find the fashion world enticingly interesting. One of the reasons are that the fashion industry is filled with passionate people who follow both their dreams and visions and work immensely hard to achieve them and make them reality. Then there is this other side of fashion which I adore. The art of the clothes that meets real life and enable people to express their unique sense of style and flair that makes the world so very beautiful. I love a strong character in a person which is enhanced to full bloom by the way they dress. 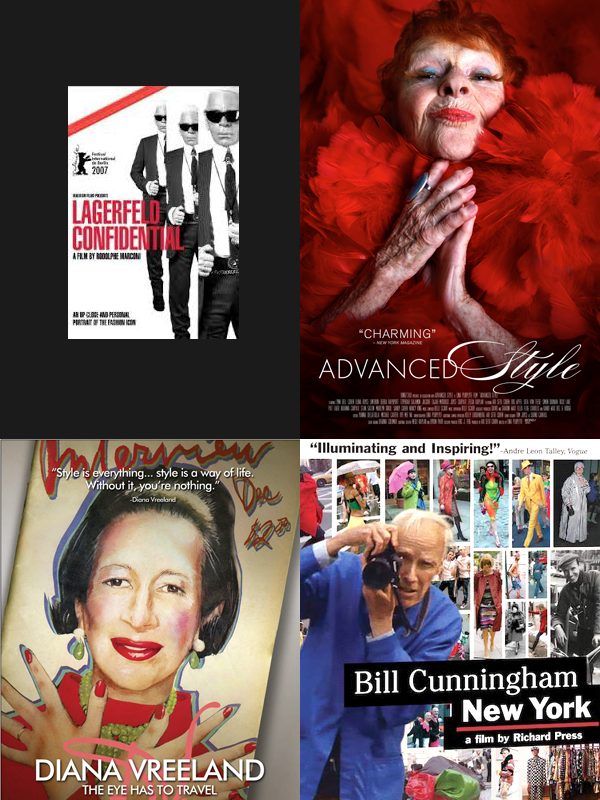 Therefore I have put together my top four fashion must see documentaries that will inspire you, that encapsulates all aspects of fashion which I love and get so inspired by. Her unique beauty, work ethic and style brought her to Harpers Bazaar. She is also the inventor of the Met Gala. This movie proves that passion gets you everywhere. This man has devoted his entire life to documenting the unique beauty of the streets of New York. He is simply amazing. Seven beautiful women who live in New York which is regularly photographed by Ari Seth Cohen from the Advanced style blog. This blog has contributed with a change in the worlds towards the better. The fashion houses and magazines have realised that older women are beautiful and they too should be included in all areas of fashion. Even Karl Lagerfeld has to do things himself if he is not happy with the result. This is an intimate view of Karl, where you get to follow him both in action while creating and in his home. A exclusive peek inside a beautiful genius world. This move makes me want to work even harder at reaching my dreams.